Winslow, Arizona’s claim to fame was firmly established in 1972 when the Eagles sang “Take it Easy,” which includes the line “standing on a corner in Winslow, Arizona.” The Standin’ on the Corner Park features a life-sized bronze statue of a balladeer (AKA, Easy), a flatbed Ford, and a mural that depicts the lyrics of the popular rock ballad. The park, built by the Standin’ on the Corner Foundation, was built in 1999. The music to the song was written by Glen Frey of the Eagles, and the lyrics were written by his good friend Jackson Browne. Apparently there really was a girl in a flatbed Ford. Renowned artist John Pugh is the creator of the trompe l’oeill style mural that graces the brick wall. The bronze statue of the balladeer was made by sculptor Ron Adamson, who began his sculpting in Libby, Montana. U.S. Route 66 was originally routed through the city. When Interstate 40 was built north of Winslow after 1977, it replaced U.S. Route 66 in its entirety. 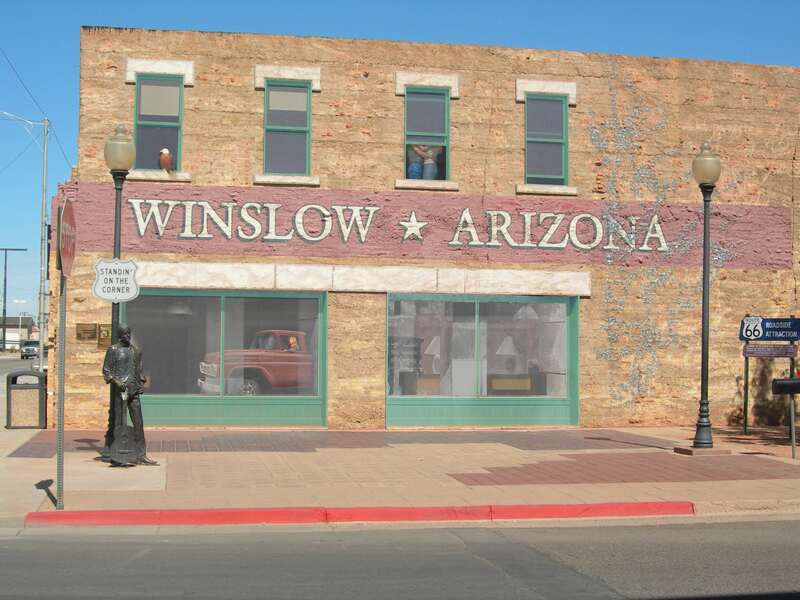 The booming railroad town of Winslow was born here 130 years ago. The town is named either for Edward F. Winslow, president of St. Louis and San Francisco Railroad, or prospector Tom Winslow. The Lorenzo Hubbell Trading Post Building has been restored and is now the “home” of the Winslow Chamber of Commerce/Visitor Center. I challenge you to post no more than 20 photos (fewer is better) and to write less than 350-400 words about any travel-related photography intention you set for yourself. Include the link in the comments below by Wednesday, August 1 at 1:00 p.m. EST. When I write my post in response to this challenge on Thursday, August 2, I’ll include your links in that post. Candy, of London Traveller, wrote a beautiful and informative post with gorgeous photos of a special church and enclosure in Brittany. Carol, of The Eternal Traveller, posts some square shots of roofs throughout the Australian capital cities. Jo, of Restless Jo, has a beautiful photo essay of the Tall Ships Race in Sunderland. Anabel, of Glasgow Gallivanter, has beautiful photos of the canals of Amsterdam. What a wonderfully ‘cool’ place, Cathy! 🙂 🙂 I always loved the Eagles, but often when I’m singing along I don’t pay specially close attention to the lyrics (a few of my own always sneak in 🙂 ). I enjoyed seeing them written down and the clever way you’ve put this post together. It’s great! And thanks for including my post. I didn’t count but I’m sure I will have exceeded your recommended number of photos. Oh well, I often exceed my own recommended number of photos; my intention is always to include less, but then I want to put one or two more in! I can hardly ever resist. Thanks for sharing your tall ships here. Have a beautiful day, Jo. It’s a great one here – have to go out for a long walk with my pack…. So many places to go here on our planet, so now here under the following link you find a survey to a mythical place at Lake Constance not existing any more like this so it is in fact a more imaginary journey and more short post. Thanks so much for sharing about this mythical place, Ulli. I’ll link this to my next photography post. Next week a little bit more exciting with the climbing on Mt. Sinai. Now, I would wish to be already in the mountains for some freshness as it is still really crazy hot and so dry here with us. Nice weekend! Oh, great slice of the past! I had intended to create something, but hey, for next mont perhaps! Proof that I have also been here! But there only seems to be one figure? Thanks for the mention. I like the plans for rejuvenating the city after the loss of Route 66. My favourite is the statue of a man holding up the lamp-post – just exactly the stance. I’m working on a photo intention to capture kerbside rubbish in the 6 streets of Potato Point. Does that qualify???? Thank you, oh Muse. Now I just have to remember. Muse because you’ve inspired Jude, Jo and Sue to write differently and splendidly. Great collection of photos and I like the clever way you’ve used the words from the Eagles song. Like Jo I really don’t take notice of song words just hum along with the tunes I like. What an easily absorbed history lesson you have given me. This is a place I knew nothing about (I haven’t visited the USA very often and when I have it’s just been to the cities, like Chicago, New Orleans, LA, San Francisco etc., never had the change of driving outside). Mind you, I can spend a whole holiday just wandering around a city without feeling I need to explore further. Loved the illustrations and the story, and Route 66 (in song) now will always include the picture of the store and “standin’ on the corner”. Looks like a very interesting place to visit Cathy. And I am also an Eagles fan! One thing I felt I should point out is about your use of song lyrics. When I was going to quote song lyrics in a San Francisco post I looked up the copyright issue and it appears that it can be quite controversial, so I removed mine and simply used the song title which is fine. Personally I love reading lyrics in a post. but I am sure you can research into it. Just wanted to let you know. I always wondered about that but just assumed that it wouldn’t be a problem as I’m only using some of the lyrics and also directing to YouTube in a link which would introduce people to songs they might not have already heard, and thus possibly lead to sales. I’m sure that thinking isn’t right where greed and money are concerned though. I guess I’ll have to cut back my lyrics in my posts to one line or so, or just the title. It’s such a bummer though, isn’t it? I know. You credit the lyricist and the musicians too, but it seems it can be an issue. They do add to a post I think. You could risk it. I just felt safer to only leave in the titles. What fun it is to see the town really make the most of those few lines in a song. I could have also linked my Bee Gees post to your post, with its musical setting! Thanks for including my cityscapes. So Mary is a fan of penny press machines? She better hop in the car and head to Winslow then. 🙂 Enjoy your weekend, Pit. She sure loves her penny press machines. Check this [https://wp.me/p4uPk8-Oq] out! Thanks so much for this piece, Pauline. I loved it, and I learned so much about you. Thank you for sharing so much of what makes you the adventurous person you are today! 🙂 I’ll link this to my Tuesday post. Pleased you enjoyed it Cathy, thanks for inspiring me. Thanks for the ear worm Cathy! Very cool, Cathy! Although I suppose Winslow, Arizona is not exactly cool in terms of temperature. The temperature wasn’t bad when I was there, but that was mid-May. It wasn’t a bad time of year to visit that part of the country. I don’t think I’d want to be there now. Especially, as I’ve heard there are lots of wildfires raging out west. While I was in Mesa Verde, they said they’re extremely prone to wildfires due to thunderstorms.